This origami-inspired building system invites you to construct the blocks themselves. 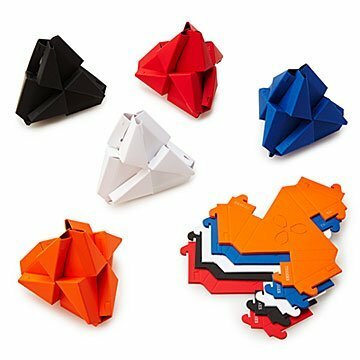 Any set of building blocks lets you construct things, but this origami-inspired system invites you to build the blocks themselves. Based on triangular geometry, the colorful sheets are selfless little beings—they only connect with others and never themselves. Take four or more of the ingeniously engineered pieces, pre-fold them along their scored lines, and snap them together to hug it out. Those tetrahedrons (or octahedrons, or omg-that's-alotta-hedrons) fit together in brightly colored, futuristic forms limited only by your imagination. The super-durable paper pieces will stand up to multiple folding and snapping-together adventures. It's an addictive gift for armchair architects ages 8 and up. Made in New York City. We spoke with Jonathan Bobrow, creator of our Origami Building Blocks, about creativity, baseball, and the most inspiring bits of running a business. Read more on our blog. I was surprised that this was paper and not plasticâ€”originally I thought it was a snap-together plastic that could be used again and again. It's a good quality paper but it felt like a lot of money for what it was. A bit challenging at first, once you make your first tetra (building block) you feel a real sense of accomplishment and satisfaction! The pieces fit together to make more and more complex shapes. The possibilities for what you can build are endless. Encourages imagination and creativity. A wonderful activity for older children and adults. Good family activity. Once you get the hang of making the tetras I find it to be tremendously relaxing and stress-reducing. Moreishly addictive. Bought as gift, kept for self! I had a great time figuring out how to combine these pieces in different configurations to make different shapes, and then combining them, endless possibilities! I took some to a family party and gave them to the kids to play with, they were ages 8 through 16 and all of them enjoyed this. I got these through the Kickstarter campaign and will be coming back for more after seeing how much everyone enjoyed them at Thanksgiving. Thanks to Jonathan & the Move38 team for creating these! Troxes origami building blocks are just challenging enough to be interesting but not so challenging as to be frustrating. My son and I both enjoyed playing with them for hours, experimenting with different shapes and configurations. Overall they held our interest longer than I'd have thought possible. Highly recommended!